Hotel Joli in Palermo is located in the historic center and it is easy to reach from the train station, the port, the airport and the highways. The hotel is on the corner of the beautiful Piazza Ignazio Florio, just steps away from the most important cultural, tourism and commercial sites in the city. Near the elegant historic Via della Libertà and Via Notarbartolo neighborhoods, Hotel Joli is located in the heart of Palermo Liberty. Here at the end of the 1800s and the start of the 1900s there were large theaters, stages for music, public gardens and kiosks. It was an incredible era that still makes Palermo a fascinating and highly important cultural center. From Autostrada Catania Palermo take Via Oreto and continue until reaching Stazione Centrale. Then take Via Roma and continue for about 2km, until reaching the cross at "Via Mariano Stabile" or "Via Principe di Granatelli" and turn right. If you take? "Via Mariano Stabile" turn on the first road to your left, on Via Michele Amari where at no.11 you will find our Hotel. If you turn instead on "Via Principe di Granatelli", the Hotel will suddenly appear. From Porto di Palermo you will be able to reach the hotel very easily on foot in about 5 minutes: Exit from the main entrance and keep going straight until you reach Via Michele Amari (4th road on the left), where our hotel can be found at no.11. If you are coming by car, take the same route but turn on "Via Principe Di Scordia" (3rd road on the left) and continue up to "Piazza Ignazio Florio". The Hotel is located exactly at an opposite corner of the Piazza. 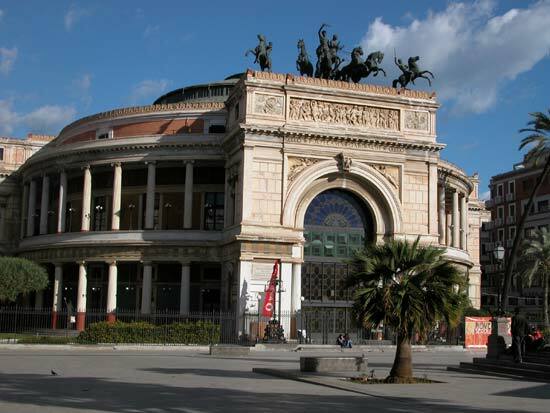 Exactly 500 meters from the hotel, in Piazza Ruggero Settimo, one can admire the Neoclassical Teatro Politeama Garibaldi, with the grand arch and the spectacular bronze quadriga on the facade. 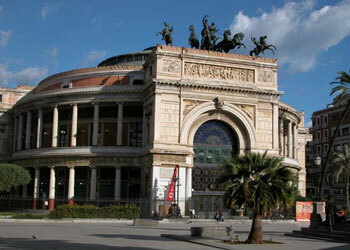 Opened in 1891 it is the second of Palermo, the first one being the Teatro Massimo of Piazza Verdi, at 600 metres from the Hotel. Inaugurated in 1897, a few years after Politeama, it soon became the hub of artistic and mundane Palermo life, making the city one of the most lively European centres for its cultural and commercial endeavors. Take note of the typical liberty kiosks found across the theatre, with the Vicari on the right and on the left Ribaudo. Always close to the Hotel Joli, at 400 meters, is located the very refined Villa Withaker or Villa Malfitano; built in 1889, which to this day is surrounded by a magnificent lush garden. The oldest part of Palermo is on the east side of the city and here you must pay a visit to the many attractions and museums.